Getting bored by your usual elliptical workouts? Maybe it's time for a change. 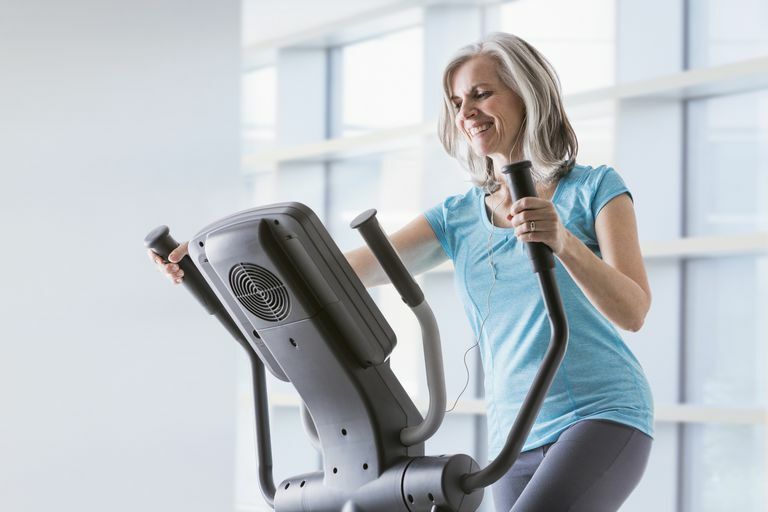 This elliptical trainer interval workout is just what you need to step things up, burn more calories, and make your workout just a little more interesting. Here's how it works: You'll do about 7 high-intensity intervals will require you to increase your resistance levels in 1 to 2-minute increments. Your goal is to get your heart rate up and get to about a Level 7 or 8 on this Perceived Exertion Scale. Between each high-intensity interval, you'll get a recovery period of about 1 or 2 minutes to let your heart rate go down, catch your breath, and get ready for the next interval. You want to work outside of your comfort zone, but not so hard that you feel breathless. See your doctor if you have any medical conditions, injuries, or other problems that preclude exercise. Start with a warm-up and gradually increase your intensity, either with speed, resistance, or both until you're working at a moderate pace, or about a Level 4-5 on this Perceived Exertion Scale. Perform each interval as shown, increasing or decreasing resistance to work at the suggested perceived exertion. The resistance levels are only suggestions, so choose a level that works for you and back off if you feel you're working too hard. Finish with a cool down and a stretch. One thing to consider is that, as the workout progresses, you'll get tired and you may not be able to sustain the same level of resistance. The idea is to try to stay at the same level for each interval but, if you're getting too far out of your aerobic zone, to the point where you're breathless, decrease your resistance as needed. Interval training, by definition, is designed to get you out of your comfort zone so that you're working harder, but only for short periods of time. You want to think about how hard you can work for the allotted time. For example, if a work interval is one minute, you can probably work at a higher level than, say, a 2-minute work interval. Similarly, the recovery intervals should leave you feeling ready for the next work set. If you're still breathing hard take some extra time to recover. Last, don't skip the warm-up or the cooldown. The warm-up allows you to gradually increase the warmth in your muscles so that exercise is easier. The cooldown lets your body come back to where it was before you started. Think of it as your reward for a job well done and a time to breathe and reflect on your workout.